Home ▸ http://www.blogger.com/img/blank.gif ▸ Emerson Network Power’s Smart Solutions Tour Review. Emerson Network Power’s Smart Solutions Tour Review. Hope you didn’t miss Emerson Network Power’s Smart Solutions Tour, but in case you did here are a few of the highlights: In addition to having a live SmartMod to tour, Emerson Network Power delivered compelling presentations on SmartRow & SmartAisle versus conventional builds for their new integrated infrastructure that covers integrated power, cooling, fire suppression, management and control. 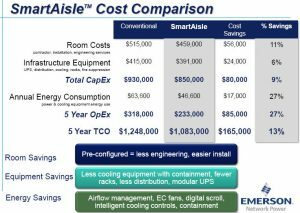 Case studies were presented where SmartAisle solutions save 9% in CAPEX, 60% in real estate & 27% in energy versus a conventional build for a medium size data center. Equally a SmartRow saves 9% in CAPEX and 27% in energy versus a conventional build for a small data center. Emerson Network Power also showed new additions to their XD line offering more breakthroughs in Data Center efficiency. The XDR is a pumped refrigerant rear door passive cooling fanless heat exchanger module. The XDR installs as the rear door of an equipment rack, providing up to 20kW of room neutral cooling. XDS is a pumped refrigerant cold plate technology to remove heat directly from servers through conduction for high density server racks at 20KW or 40KW. Emerson Network Power also presented their future on data center management & control tools where existing tools, such as; SiteScan, Nform, Aperture, Data Center Planner and DSView will roll-up to the new Trellis platform to be released in December of 2011. Trellis through data rolled up from these point solutions and analytics will empower stakeholders with recommendations for managing, planning & optimizing their data center facility and IT infrastructure.